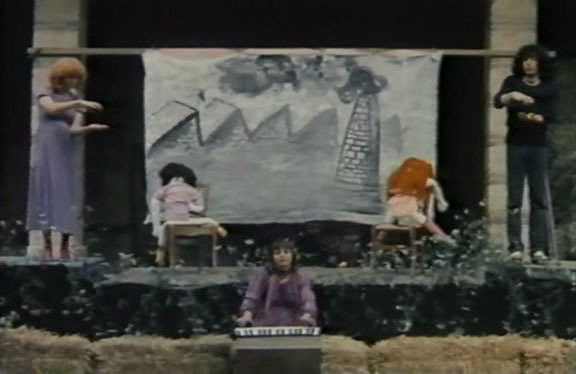 For those who didn’t get Le Bonheur and thought it was asserting male dominance and endorsing cheating on your wife, here’s Varda’s explicitly feminist movie – exploring the joys and pitfalls and terrible music of 1970’s feminism. Unfortunately, explicit feminism (or explicit anything) doesn’t work as well for me as Varda’s more ambiguous movies have… movie is kinda obvious and messagey at times, but she still takes a multifaceted story approach to her message. Anyway, ten years after the suicide, the women meet at a women’s rights demonstration. P is calling herself Apple now, sings a cheesy “my body is mine” song, playing the worst kind of acoustic guitar and tambourine folk. Actually I kinda liked the piano song she sings on an Amsterdam canal boat with her fellow abortion patients later on. S runs a women’s clinic, while P tours her music and theater group, and the two keep in touch sporadically over the years through the mail. Suzanne eventually marries pediatrician Pierre and Pauline goes to Iran with her man Darius (an economist? ), and now the two have to cope with being wives and mothers while trying to keep their values uncorrupted. P finds it’s tough to be feminist in Iran so she ditches her guy and returns home. 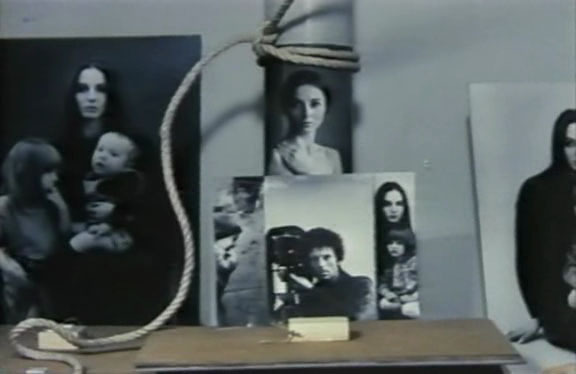 Ends with a lingering shot on Suzanne’s grown daughter, looking troubled at the thought of taking over the plot. P. Kael said “Varda brings a Disney touch to women’s liberation.” Otherwise there isn’t crap about it on the internet, besides saying it’s from France, Belgium and Venezuela, which doesn’t even seem to be true. Every movie released in 1977 looks dirty and cheap. Did the entire international film world’s budget go into the first Star Wars? Dialogue is in French, but credits and voiceovers are in English, hmmm. Maybe all this is because of my shady videotape copy. 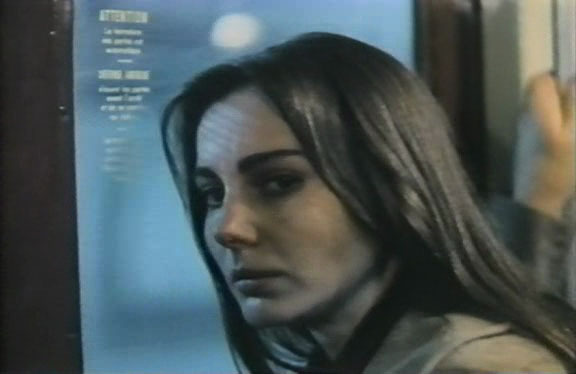 Pauline (Valérie Mairesse) was in Tarkovsky’s Sacrifice and Lucas Belvaux’s Trilogy and Suzanne (Thérèse Liotard, above) was in a Bertrand Tavernier sci-fi flick with Harvey Keitel and Harry Dean Stanton – must see that. The composer shows up as an actor, with four-year-old Mathieu Demy in tow. Assistant camera (in the Iranian scenes?) 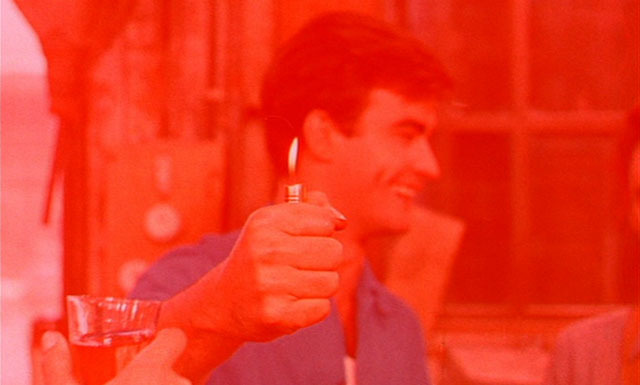 is appropriately by Nurit Aviv, France’s first licensed female cinematographer. Francois is so happy, because he has a wife (Therese) who cares only for him and their two lovely kids. He has a rewarding job as a carpenter, and a good relationship with his brother. One day he meets lovely postal worker Emilie and starts an affair with her, and now he’s even happier. Francois has so much joy that he can’t contain it all, so he tells his wife how happy he is to have two lovely women in his life, and an hour later she goes off and drowns herself. A few months pass before Emilie moves smoothly into the role of wife/mother, and Francois’ happiness continues as before. 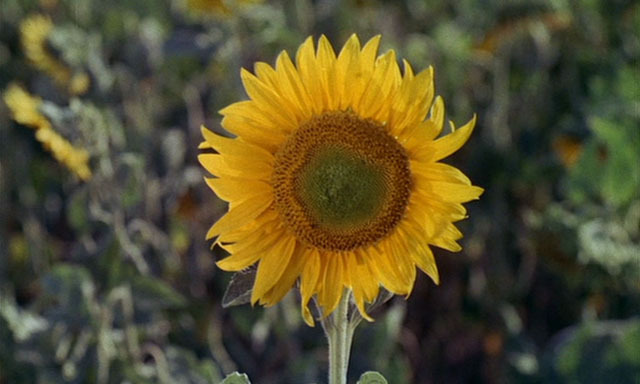 The movie, with its bright colors, prominent music, and unsettling focus and editing tricks, is amazing – probably my favorite Varda movie so far. I’d heard it was a deeply ironic, very unhappy movie but I don’t think that’s true, despite the death (not explicitly a suicide). 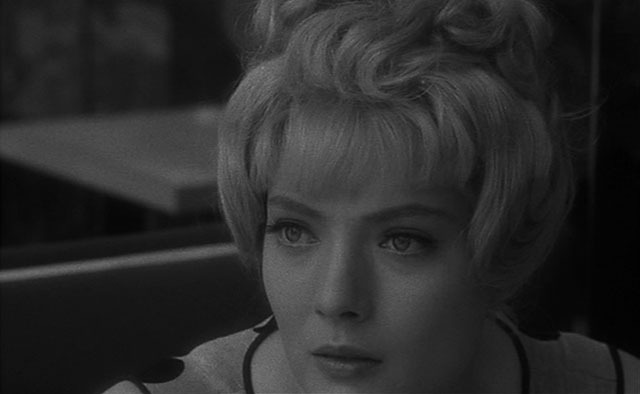 Varda’s got happiness (in feeling and appearance) on her mind, but isn’t cutting it down or saying it doesn’t exist. 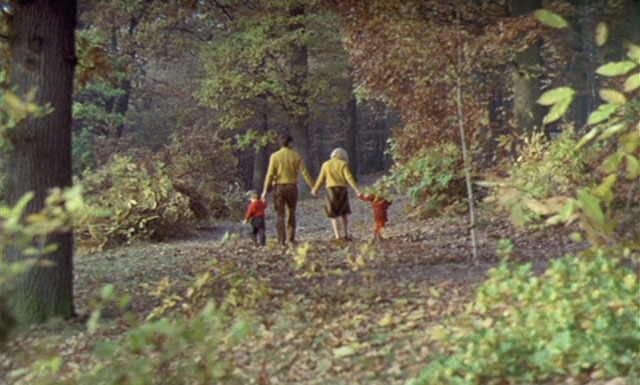 Agnes says at the time she hadn’t seen another film called Happiness and she liked the word. I guess Marker didn’t get the Medvedkin reissued until a few years later. 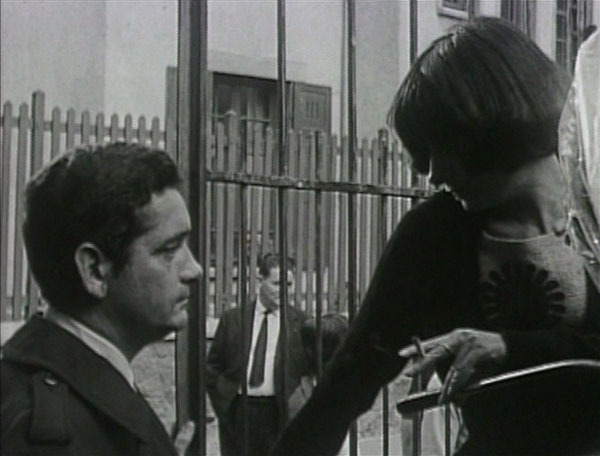 Lead actor Jean-Claude Drouot would go on to appear in Chabrol’s La Rupture and Klein’s Mr. Freedom, and his wife would continue not to be an actress, never appearing in another film. Marie-France Boyer (Emilie) had a couple starring roles after this, but fades away after 1970. 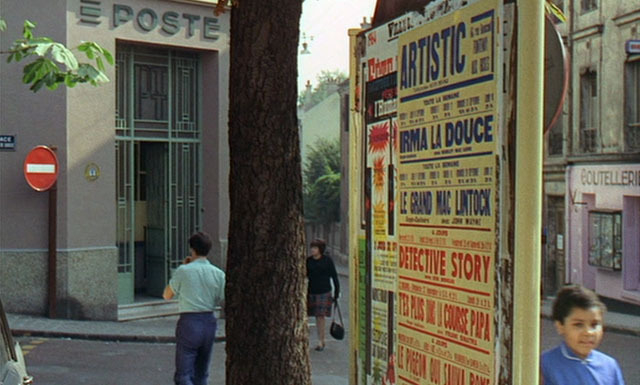 A few film references: they go to see a Louis Malle comedy (not giving the title or director, so it took some sleuthing), and watch a scene from Renoir’s Picnic on the Grass (an appropriate title, and another impressionism reference) on television. Then there’s the poster below, advertising Wilder’s Irma la Douche, John Wayne in McLintock, and is that Wyler’s 12-year-old Detective Story? Movie got a silver consolation prize in Berlin after being beaten to the gold by Alphaville. The New York Times didn’t get it (and called it Varda’s second feature – I guess if La Pointe Courte didn’t play NYC it doesn’t exist).